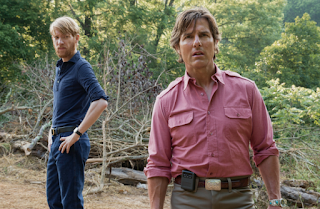 The new film from the creative team of director Doug Liman and star Tom Cruise, who previously worked together on Edge of Tomorrow, American Made is based on a true story that maybe I should have known already, since it deals with some major things that occurred in the 1980s, but I'll trade some ignorance of historical events for the viewing experience I had seeing this movie on its opening day. 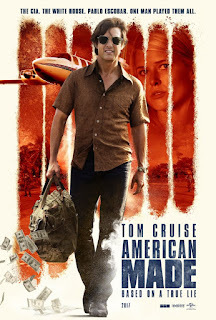 Since I didn't know anything about the real Barry Seal, the man Cruise portrays in the film, and only had a passing familiarity with some of the people and scandals he gets involved with over the course of this telling of his story, I never knew where things were going to go. (Or if anything might not be true-to-life accurate.) I was enthralled from start to finish. The film covers Seal's life from 1978 to 1986, during which time he sort of bumbles his way through seriously dangerous situations and crosses paths with familiar names from the past like a greedy, unscrupulous Forrest Gump. He starts out as a talented but bored pilot for TWA who has been smuggling Cuban cigars, which catches the attention of the CIA. He's recruited by an agent called Schafer (Domhnall Gleeson) to fly a spy plane over the camps of Soviet-backed Communist insurgents in places like Guatemala and Honduras, snapping pictures. Soon he's also picking information on the insurgents from General Manuel Noriega in person in Panama, swapping files for cash. During a stop in Colombia for fuel, Seal finds that his flights in their area have caught the attention of the Medellín drug cartel, who give him the task of smuggling cocaine back to the United States in his CIA-provided plane. Seal doesn't seem to mind getting into the drug business at all, especially when it starts paying off in a major way. And so it goes, Seal doing various jobs for the cartel while also doing various jobs for the CIA, getting involved with running guns to the Contra rebel groups in Central America that President Reagan hoped would go to battle with the Communists. The stuff Seal gets into is incredible, and he never seems to hesitate or feel pressured to do things, he just dives right in. Sure, he'll risk being murdered, or being sent to prison, or getting the hell beat out of him. If armed rebels knock him around during one visit to their camp, he'll just go back with gifts... and a baseball bat, as if that's all the protection he needs from guys he's giving machine guns to. In the midst of all this insanity, Seal is also a family man, with a wife, Sarah Wright as Lucy, and kids. Lucy spends years being clueless about what her husband is doing, but she eventually embraces his success. One thing that stood out to me about this character is that she managed to drop an F-bomb is almost every scene she was in. It's just something I noticed; I lost track of it toward the end, but during most of the movie I watched her scenes waiting to see where she was going to work in the f*ck. There's a lot of fun to American Made, and a healthy dose of suspense, given the dangers Seal deals with. The CIA, the cartel, US customs, and other organizations aren't the only troubles Seal has to contend with - he's also saddled with a scuzzy brother-in-law played by Caleb Landry Jones, who also played the girlfriend's scuzzy brother in Get Out. The minute this guy shows up on screen, you know he's going to cause trouble. 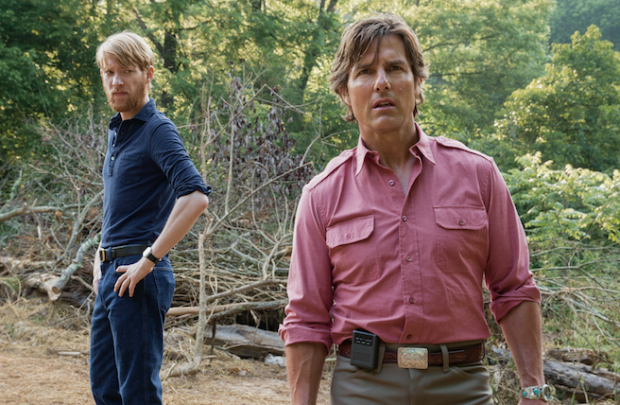 Cruise does a great job making Barry Seal a likeable guy, despite the things he does. There's nothing malicious about him, he's not a dark character, he's just taking advantage of the opportunities in front of him and doesn't seem to give any thought to the big picture consequences of what he's doing. I was concerned for this guy's well-being, and since I didn't know the real story I didn't have the spoilers of his real world fate in my mind. As the walls close in on him, I was hoping he would find a way out. If you don't know the real story of Barry Seal, I won't spoil it for you. I also really liked seeing Cruise work in a drama again. At one point, this is the kind of movie you'd usually find Cruise in, but for the last several years (for most of this century, really) his primary focus has been on action. I love his action movies, but it was nice to see him take a little break from the hero stuff. Although I had been a big fan of nearly every movie Jean-Claude Van Damme made between 1988 and 1994, by the time 1996 rolled around I had moved on from watching Van Damme movies - so much so that I never even watched The Quest. I only just recently got around to watching the movie in full, twenty-one years after it was released. It's not entirely my fault that it took me so long to watch it; these last twenty-one years have gone by way too quickly. By skipping The Quest, I missed out on seeing a movie that is in the vein of Van Damme's earlier films Bloodsport, Kickboxer, and Lionheart. In a way, he was sort of getting back to his roots with this one, as it follows his character Christopher Dubois as he trains in martial arts and ultimately competes in an international fighting tournament. Instead of the Kumite, this time the tournament is the Ghang-gheng. Van Damme directed this film himself, making his feature directorial debut while working from a screenplay Steven Klein and Paul Mones wrote based on a story Van Damme crafted with Frank Dux, the man he played in Bloodsport. Unlike the situation with Dux and the Kumite, Dubois doesn't start out planning to go to the Ghang-gheng, circumstances just happen to lead him to the tournament. Dubois is introduced as a street criminal, an orphan taking care of other orphans on the streets, who has to go on the run from the authorities. He ends up crossing paths with the unscrupulous Lord Edgar Dobbs, played by Roger Moore, who ditches him on an island where he's forced to fight. Eventually, however, Dubois comes to see winning the Ghang-gheng, and the golden statue winners are given, as a way to help those orphans. With Dobbs, Dobbs's pal Harry Smythe (Jack McGee), reporter Carrie Newton (Janet Gunn), and fellow fighter Maxie Devine (James Remar) as his companions, Dubois makes the trek to Tibet, where the Ghang-gheng is held, and once they have arrived at their destination we are treated to some good fight sequences. It takes the film a little longer than I would have liked to reach the tournament, more than 50 of its 95 minutes have passed before the matches start, but it's interesting up to that point anyway. What helps The Quest stand apart from Van Damme's other tournament movies is the fact that it's a period piece, set in 1925. That gives the film a unique feel, and also allows for book end scenes in which Van Damme is plastered with old age makeup and gets to show that his character still has fighting skills in his nineties. Van Damme did a solid job with his directorial debut, The Quest looks great and provides an enjoyable viewing experience. I should have given the movie a chance twenty-one years ago, as I probably would have liked it then just as much as I did now. The most positive thing I can say about The Limehouse Golem is that director Juan Carlos Medina had a commendable confidence in the way he chose to bring the story written by Jane Goldman (based on the 1994 novel Dan Leno and the Limehouse Golem by Peter Ackroyd) to the screen. Due to the style and structure, a portion of the viewing audience is going to find this film to be absolutely impenetrable - and I can attest to this because I was confounded by it from time to time myself. It lures you in by promising to tell the tale of a search for a serial killer, but a dramatic character study overshadows the thrills and chills until late in the running time. The tale plays out in a non-linear fashion, jumping back and forth in time, and it's told through characters with accents so thick you're likely to miss a good chunk of what they're saying unless you have the subtitles on. It's a detective story that begins after several murders have already been committed, which you might imagine is a way for a film to hit the ground running, but it actually makes it harder to follow because the investigators are referencing victims and crime scenes (and crimes that happened decades further in the past) that we have no knowledge of. This is a film that's only going to be embraced by a niche audience while putting off a lot of viewers, and Medina went for it without any evidence of hesitation. 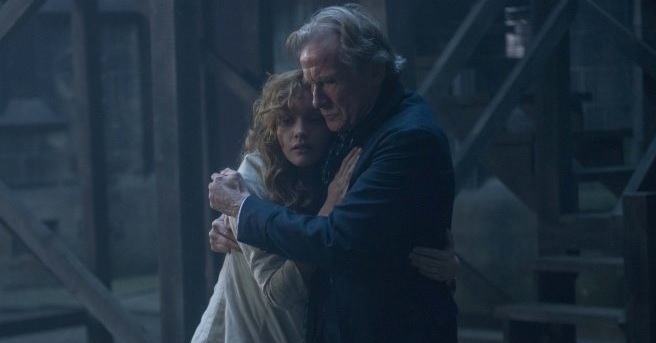 Bill Nighy (who had to step in after the previously cast Alan Rickman left due to health issues) stars as Scotland Yard investigator John Kildare, who has been tasked with bringing the Limehouse Golem to justice, "The Limehouse Golem" being the nickname the public and media have given to the perpetrator of a series of gruesome murders in the Limehouse district of London in 1880. 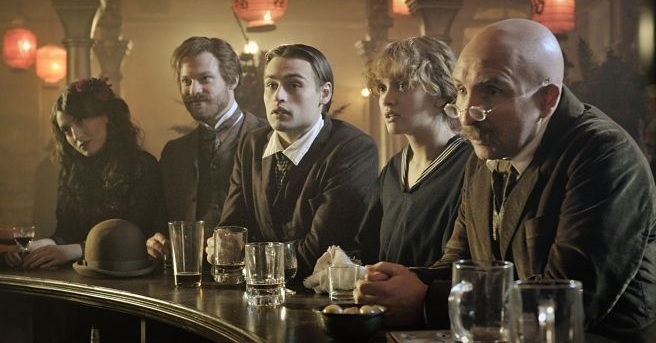 Kildare's investigation brings him into contact with some real life historical figures - musical theatre actor Dan Leno (Douglas Booth), philosopher Karl Marx (Henry Goodman), author George Gissing (Morgan Watkins) - but it's Leno's fellow actor Lizzie Cree (Olivia Cooke) who ends up being his primary focus. Lizzie happens to be in police custody, accused of poisoning her husband... who happens to be a Golem suspect. This is where the dramatic character study aspect comes in, as Kildare hears Lizzie's entire life story while trying to get to the bottom of what happened between the Crees. Most of The Limehouse Golem's 109 minutes are dedicated to showing us Lizzie's escape from a horrific childhood into the world of musical theatre, where she becomes a star alongside Leno. Cooke, who played a fan favorite character on the Bates Motel television series, does a fantastic job in this film, there is no flaw in her performance, but this is not the story I expected to be seeing when I put on Golem, so the more time we spent in Lizzie's past the more tiring and frustrating it started to become. I expected there to be more serial killing in this serial killer film, and the scenes where we got to see some of that were my favorites. These moments come when Kildare considers the likelihood of a suspect being the killer, and we get to see the suspect carry out a version of one of the murders while the Golem narrates in a demonic voice. That was much more interesting to me than watching Lizzie find herself on stage. The Limehouse Golem isn't a bad movie, it looks wonderful and the cast does great work bringing their characters to life, I just found the way the story was told to be rather dull and disappointing. This approach didn't work for me very well. The movie got more enjoyable and interesting as it went along, and I will say that there's a satisfying pay-off to spending so much time witnessing Lizzie's story, but getting to that pay-off was challenging. If you're a fan of Cooke and/or Nighy, or if you like oddball stories set in Victorian England, you might want to give The Limehouse Golem a chance. However, I do not recommend trying to watch this film while drowsy, because it is very likely to knock you unconscious. Apparently the Death Note property is something of an international pop culture phenomenon, starting with a manga series that first starting arriving on store shelves in Japan in 2003 and quickly started receiving all sorts of adaptations and spin-offs in the country. There's an anime series, live action films, novels, video games, a live action TV show, and even a musical. But honestly, the only time I ever heard about Death Note was when there would be updates on the effort to make a live action adaptation in America. 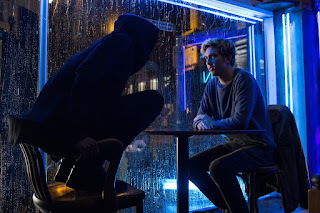 After years of development hell, during which time the project passed through the hands of Gus Van Sant and Shane Black, the American version of Death Note ended up being made by director Adam Wingard (Pop Skull, A Horrible Way to Die, You're Next, The Guest). With a screenplay by Charley Parlapanides, Vlas Parlapanides, and Jeremy Slater, the final result is quite a strange film - especially for someone like me, with no knowledge of the source material. Nat Wolff stars as Light Turner, a high school student who becomes the new owner of the titular supernatural notebook when it just drops out of the sky one day. When Light leafs through the book, a crazy looking eight foot tall creature, a death god called Ryuk and voiced by Willem Dafoe, appears to him and encourages him to put the book to use. What does it do? Well, if you write someone's name down while picturing their face in your mind while doing so, that person is going to die within the next 48 hours. The owner of the notebook can even choose how they want that person to die, and Ryuk will make sure it goes down that way, even if it requires a Final Destination-esque sequence of events. Light tries it out on the school bully. Gory success. Then he uses it to get revenge, targeting the man who got away with the vehicular death of his mother. Vengeance is his. When Light lets his crush, cheerleader Mia Sutton (Margaret Qualley of Shane Black's The Nice Guys) in on the power of this book, the pair strike up a relationship and things get out of hand. Soon Light and Mia have condemned over 400 people around the world to death, taking out terrorists and criminals. No innocents. They may think they're making the world a better place, and maybe they are, but law enforcement can't just let someone get away with hundreds of murders, and the teenagers have made the mistake of leaving a calling card behind at the death scenes - graffiti crediting the deaths to "Kira". Kira earns a devoted fan base, but the authorities are determined to bring them to justice. You might think it would be impossible for the authorities to trace these worldwide activities back to teenagers with a notebook, but you wouldn't be counting on the presence of Lakeith Stanfield as L, the most manga/anime character in the film (aside from Ryuk), a man who has been trained since childhood to be the greatest detective the world has ever known. It doesn't take long for L to figure out where Kira is from. The concept of the notebook is fascinating, and it's presented in a better way here than I expected it to be. I didn't think I would like Light, I didn't think I would be able to accept the choices he makes when give the power over life and death. I thought he would be thinking much smaller than he does, not that he would take aim at hundreds of terrorists and criminals, essentially making himself a version of The Punisher who only needs a pen. Light still isn't a character I could connect with and he's not a hero, but he thinks more like a hero than I thought he would. He has a personal rule against killing innocent people... Too bad that's not a moral line that Mia has drawn for herself. Death Note is strange and unique (at least, I think it's unique, having not seen or read any other take on the material), an oddball film with some captivating performances, great music, and excellent visuals. Helping Wingard capture those visuals was second unit director Jason Eisener, the director of Hobo with a Shotgun. Some fans of previous iterations of the story have been upset with Wingard's film, but this Death Note novice was entertained.